Even though President Trump calls the 100-days measure "ridiculous," the White House is still touting what one press release called the president&apos;s "historic accomplishments" — including 28 laws he has signed since taking office. But when it comes to legislation, political scientists say it is better to measure significance than to simply add up the number of bills. It is better, they argue, to ask whether a law changes the status quo or introduces a new policy idea. By that measure, there is not as much to show legislation-wise for Trump&apos;s first 100 days. "Congress passes laws all the time, naming post offices after people, doing minor things that they can get through," said Leon Panetta, who served as defense secretary in the Obama administration and as chief of staff to President Bill Clinton. Panetta doesn&apos;t see any major legislation in this administration&apos;s first 100 days. "Presidents throughout history are acknowledged as a success when they get legislation passed through the Congress — major legislation that affects the lives of people. And that ultimately will be the test for this president," Panetta said. During the campaign, Trump signed a "Contract With the American Voter," in which he promised to work with Congress to introduce 10 bills "and fight for their passage within the first 100 days of my Administration." Of those 10, only one — the American Health Care Act — has made it into legislative form, and it has not yet gotten a vote. The Trump administration did announce broad outlines of a tax system overhaul this week, but it isn&apos;t expected to be written into legislation until later this year. In a briefing with reporters on Tuesday, Trump&apos;s legislative affairs director Marc Short was asked to name the new president&apos;s most significant legislative accomplishment — to name one major new law — but he took issue with the question. "I would say that confirming a Supreme Court justice of the United States who will probably be there for 30 years is a big legislative achievement," said Short. "I would say the regulatory impact we&apos;ve had on the economy is a big legislative achievement. And we look forward in the coming days to hopefully continue to make progress on the appropriations process and on health care." When he talks about "regulatory impact," Short is referring to the 13 laws passed under the Congressional Review Act. Before Trump, the 1996 law had been used only once before, by George W Bush. 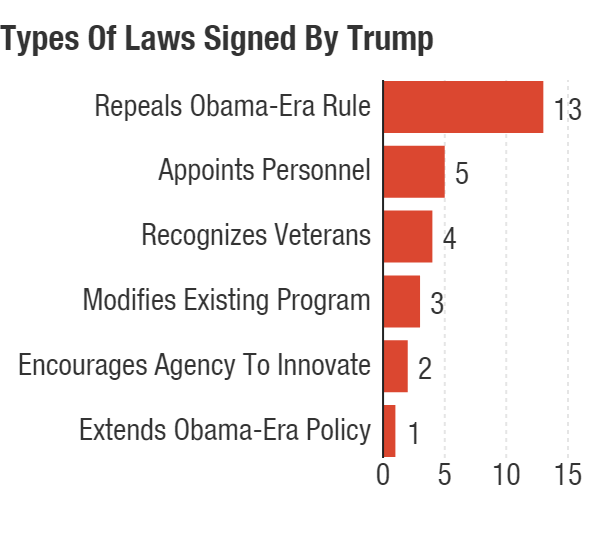 But with GOP in control of both the House and the Senate, the Trump White House had a rare chance to significantly roll back rules written by the previous administration. The Congressional Review Act allows Congress to reverse rules within 60 legislative days of their submission, requiring only a simple majority in the Senate. In the current Congress, that means Democrats are not able to block the rollbacks. House Speaker Paul Ryan touted the 13 laws as "measures to take excessive regulations off the book so we can grow this economy." They included a rule meant to protect streams from pollution, which opponents argued hurt the coal industry; and a rule requiring financial advisers to put consumers&apos; best interests ahead of their own, which critics said would hurt retirees. But in the realm of legislation, 100 days is a short period of time. Significant bills take a long time to complete, often measured in years rather than days. President George W. Bush&apos;s first tax cut and No Child Left Behind initiative didn&apos;t pass in the first 100 days. The Affordable Care Act and Dodd-Frank financial industry regulations didn&apos;t become law in President Barack Obama&apos;s first 100 days either, though he and Congress did pass a nearly $800 billion stimulus bill. Other than that, Obama signed several program re-authorizations, the Lilly Ledbetter Fair Pay Act (that had been in the works in the previous Congress) and a bill naming a post office. Time frame aside, Trump learned with the health care bill he hoped to pass and sign weeks ago that having the president&apos;s party control both the House and the Senate doesn&apos;t guarantee the numbers needed for priorities to breeze through. "President Obama faced a lot of the same problems," Panetta noted. Panetta said Trump will be judged on whether he can put together a working coalition, which will most likely require reaching across the aisle. Thus far Trump has tried to do everything with one-party rule — not even attempting to win Democratic votes (not that they would have been forthcoming). If this year ends and Trump hasn&apos;t found a way to work with Congress and pass significant legislation like the health care bill or his tax plan, he won&apos;t be judged kindly. Presidents succeed or fail based on their ability to work with Congress. S. 544: "A bill to amend the Veterans Access, Choice, and Accountability Act of 2014 to modify the termination date for the Veterans Choice Program, and for other purposes." H.R. 353: "Weather Research and Forecasting Innovation Act of 2017"
S. 442: "National Aeronautics and Space Administration Transition Authorization Act of 2017"
H.R. 72: "GAO Access and Oversight Act of 2017"
H.J.Res. 67: "Disapproving the rule submitted by the Department of Labor relating to savings arrangements established by qualified State political subdivisions for non-governmental employees"
H.J.Res. 43: "Providing for congressional disapproval under chapter 8 of title 5, United States Code, of the final rule submitted by Secretary of Health and Human Services relating to compliance with title X requirements by project recipients in selecting subrecipients"
H.J.Res. 69: "Providing for congressional disapproval under chapter 8 of title 5, United States Code, of the final rule of the Department of the Interior relating to &apos;Non-Subsistence Take of Wildlife, and Public Participation and Closure Procedures, on National Wildlife Refuges in Alaska&apos; "
H.J.Res. 83: "Disapproving the rule submitted by the Department of Labor relating to &apos;Clarification of Employer&apos;s Continuing Obligation to Make and Maintain an Accurate Record of Each Recordable Injury and Illness&apos; "
S.J.Res. 34: "A joint resolution providing for congressional disapproval under chapter 8 of title 5, United States Code, of the rule submitted by the Federal Communications Commission relating to &apos;Protecting the Privacy of Customers of Broadband and Other Telecommunications Services&apos; "
H.J.Res. 42: "Disapproving the rule submitted by the Department of Labor relating to drug testing of unemployment compensation applicants"
H.J.Res. 57: "Providing for congressional disapproval under chapter 8 of title 5, United States Code, of the rule submitted by the Department of Education relating to accountability and State plans under the Elementary and Secondary Education Act of 1965"
H.J.Res. 58: "Providing for congressional disapproval under chapter 8 of title 5, United States Code, of the rule submitted by the Department of Education relating to teacher preparation issues"
H.J.Res. 37: "Disapproving the rule submitted by the Department of Defense, the General Services Administration, and the National Aeronautics and Space Administration relating to the Federal Acquisition Regulation"
H.J.Res. 44: "Disapproving the rule submitted by the Department of the Interior relating to Bureau of Land Management regulations that establish the procedures used to prepare, revise, or amend land use plans pursuant to the Federal Land Policy and Management Act of 1976"
H.J.Res. 40: "Providing for congressional disapproval under chapter 8 of title 5, United States Code, of the rule submitted by the Social Security Administration relating to Implementation of the NICS Improvement Amendments Act of 2007"
H.J.Res. 38: "Disapproving the rule submitted by the Department of the Interior known as the Stream Protection Rule"
H.J.Res. 41: "Providing for congressional disapproval under chapter 8 of title 5, United States Code, of a rule submitted by the Securities and Exchange Commission relating to &apos;Disclosure of Payments by Resource Extraction Issuers&apos; "
S.J.Res. 1: "A joint resolution approving the location of a memorial to commemorate and honor the members of the Armed Forces who served on active duty in support of Operation Desert Storm or Operation Desert Shield"
H.R. 1362: "To name the Department of Veterans Affairs community-based outpatient clinic in Pago Pago, American Samoa, the Faleomavaega Eni Fa&apos;aua&apos;a Hunkin VA Clinic"
H.R. 609: "To designate the Department of Veterans Affairs health care center in Center Township, Butler County, Pennsylvania, as the &apos;Abie Abraham VA Clinic&apos; "
S. 305: "Vietnam War Veterans Recognition Act of 2017"
H.R. 321: "Inspiring the Next Space Pioneers, Innovators, Researchers, and Explorers (INSPIRE) Women Act"
H.R. 255: "Promoting Women in Entrepreneurship Act"
S.J.Res. 30: "A joint resolution providing for the reappointment of Steve Case as a citizen regent of the Board of Regents of the Smithsonian Institution"
S.J.Res. 36: "A joint resolution providing for the appointment of Roger W. Ferguson as a citizen regent of the Board of Regents of the Smithsonian Institution"
S.J.Res. 35: "A joint resolution providing for the appointment of Michael Govan as a citizen regent of the Board of Regents of the Smithsonian Institution"
H.R. 1228: "To provide for the appointment of members of the Board of Directors of the Office of Compliance to replace members whose terms expire during 2017, and for other purposes"
S. 84: "A bill to provide for an exception to a limitation against appointment of persons as Secretary of Defense within seven years of relief from active duty as a regular commissioned officer of the Armed Forces"